1) Get to know you game- hot potato style with questions answered. Sorry, I don’t remember the questions, but this was for the first meeting of the year, so it was basic get-to-know-you questions. You had to answer the question for the round before you could pass the hot potato. It was plastic potato with a timer in it that would go off randomly. 2) Combine apples with sugar, flour, cinnamon, and nutmeg, put in pie shell. 4) Top with second crust. Flute edges and cut vent holes. 5) Bake at 400 for 40-50 minutes or until apples are done. Cover edges of pie with foil if browning too quickly. 3)Service project- filled operation christmas child boxes and worked on sewing small bags to put items in to give to new moms at the local hospital. Plan is to work with other local MOPS groups to put fillings in the bags and the schedules/contact info for all the local group meetings. Layer in 1 Qt canning jar. pack as you layer. Add jar contents to 6-8 cups boiling water and mix; let stand 5 minutes. 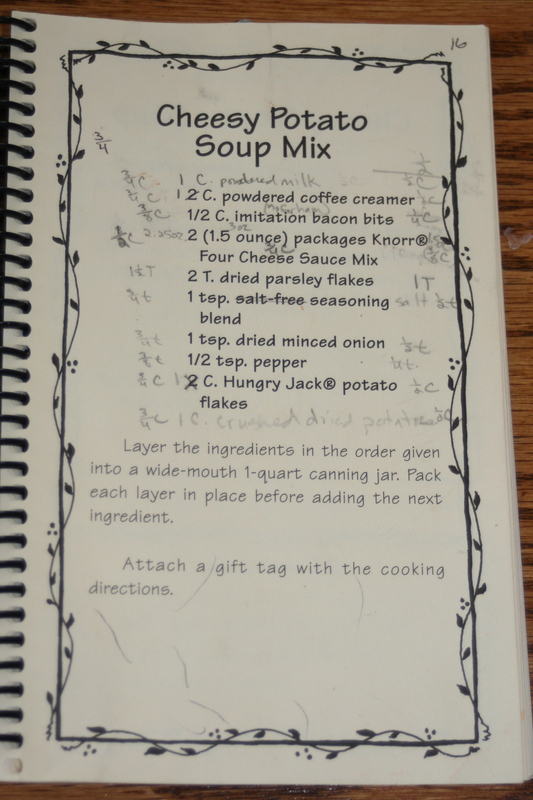 5) Our whole day was activity related when we did a “kid concoctions” day- Steering members took ideas from the book of that name, presented at the MOPS conference at one of the workshops. Each did a “how-to” lesson/commercial. Then everyone got to try making the concoctions, too. Lots of ideas of things you can make with your kids- sidewalk chalk, air fresheners, lip gloss, glitter paint, surprise soaps, splongee flyers, and other goodies. 6) Mom themed Pictionary. Select typical mothering items and activities, break up into 2 teams, and play like you would any Pictionary. 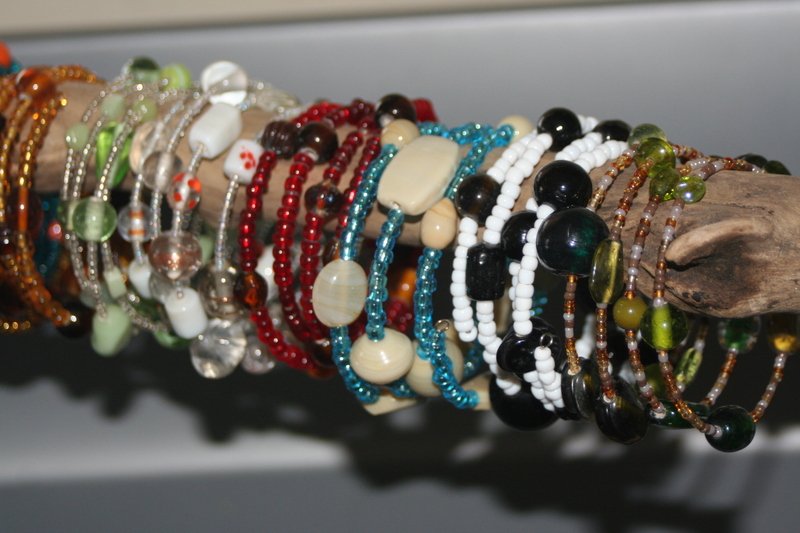 7) Memory wire bracelets- 4 rounds. I pre-cut the wire and put a loop on one end. Everyone got a bowl and selected about 25 larger beads from one table, then brought them to one of 4 identical tables to put them together. Each table had an assortment of color-separated smaller beads in little containers. Each picked a smaller bead color or 2 and put them on a cloth napkin at their seat. A SMALL amount at a time is preferred, it doesn’t take that many and it’s easy to get more, but it’s hard to get all those little beads picked up and put away! They strung them on the wire and made the finish loop with a pair of jewelry pliers. I bought beads and wire in bulk online to make it a more affordable project, but now I have a LOT of beads I have to do something with. We are doing another project this year (2011) with some of them, and I’ve used some of them up myself in crafting and for Christmas presents last year. I also made up a bunch to sell at a local craft show (my first) that unfortunately didn’t go well for me- except now I have a great collection to chose from to wear myself 😉 Decide carefully what you’re willing to spend! ***If I were going to start this project again, I’d get a nice selection of big beads and stick with a few basic colors of smaller beads. I’d also recommend “E” beads (8/0 or even 6/0) or bugle beads for the smaller ones, as they go together a LOT faster than seed beads (10/0 or 12/0). That equals quicker success and less frustration, especially for those who don’t feel very crafty. Plus the seeds can get lost in the holes of the bigger beads sometimes. A little less variety can help speed things up a lot, but everyone should still have a nice, unique bracelet when they’re done. Plus, you don’t have to buy or keep track of as many materials for this project that way! 8 ) Mommy relay game- speed contests including sorting VHS tapes into their sleeves, dressing a doll, packing certain items into a diaper bag, Sorting socks, etc. 9) Message boards- Used 1′ wide boards. Pound all your nails first- 2 on the back to make your wire hanging loop. Line up where you want everything spaced. 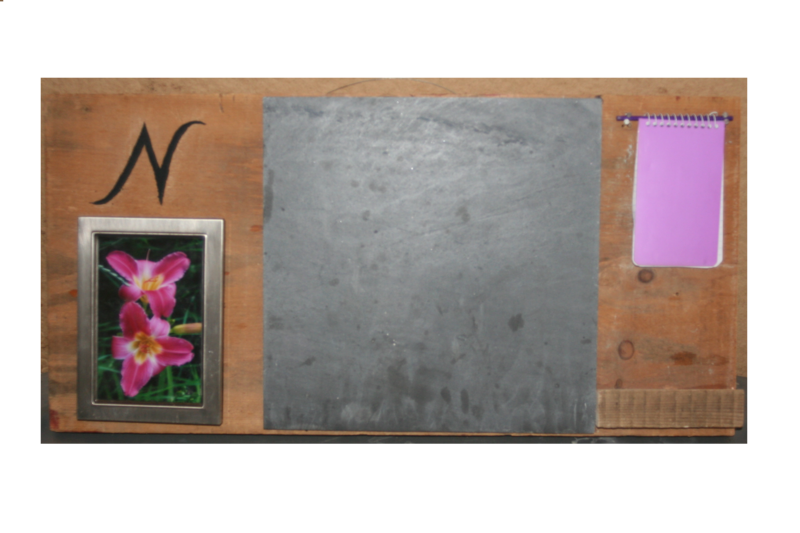 make little pencil marks to mark corners of your chalkboard space. Put the nail head into the picture frame hanger, then press it where you want it to make an indentation for where the nail goes- take it off and nail it. put nails in to support the hanging rod for your mini-notebook. When you’re done with the nails, Attach “chalkboards” (slate tile that had been ground smooth on one surface) with construction adhesive/similar (I chose a low VOC product- pregnant and nursing moms are always a consideration when I’m trying to pick projects, especially since I’ve always been in that category since I started MOPS! ) Hot glue cools to quickly to get enough on to hold the chalkboards. Use wood glue to attach a wood holder for chalk and a pen/pencil. Paint on a letter for last name if desired. We had odd materials (nice, wide pieces of wood and 1 foot black slate tile leftovers) by donation. John has a concrete polisher, so he did one side of the tiles for me. It could be done using a couple successively finer grits on a sander, too, but it would probably take longer. He also made the little chalk/pencil holders. It’s a simple strip of wood. We drilled 2 holes most of the way through to hold pens/pencils. Then we routed off all but a lip on that drilled surface, making space to keep a piece of chalk. Boards were planed on one side and left rough on the other for variety in the finished product. I like the rough, but I know it wouldn’t fit the tastes and decor or some of our other Moms. 10) Stamped and wrapped votive candles. I got the idea from a Stampin’ up! Party I went to years ago. I don’t remember exactly what paper they used, but this worked fine. Tissue paper (plain and decorative) cut to size using a pattern piece I made. Stamped/colored if desired. Use a hair dryer to start to melt the wax around the outside of the candle. Stick on the tissue paper. Roll, melt, and stick all the way around. You WILL want to make stops so the candle doesn’t roll away and you don’t burn your fingers. I just taped pencils to the table to work against. Also, choose candles that are round or nearly so. Use a scrap of paper to make your pattern to fit around, trace it onto light cardboard. Certainly would work with a larger candle- depends on your budget. I made sure my tissue paper didn’t catch fire on my sample before I made them at MOPS. I didn’t have any problems with the votive size. The wax eventually melts out of them, but they wont catch on fire unless the paper is purposely smashed over towards the flame. The paper stood up straight even after the wax all melted away for me- which takes a long time since the paper also holds all the melted wax in. Regardless, though, you shouldn’t leave candles unattended. One last note: think carefully about where you plug in hair dryers for this- or you’ll trip the breaker like we did with that much electrical pull at once! 11) Felted soaps on “spa day”- saw the idea/how to do it in family fun magazine. I didn’t have to find any materials or run it, though. We had a connection to a local spinning group that provided the wool for felting and had done the same thing with a group before, so they ran it for us. 12) Cake decorating basics- Had a home cake decorator come and show us tips on what she’s learned. Gave us handouts of basic info, some recipes, a demo on a cake, and we practiced some on cupcakes (baked by steering). Purchased some basic decorating tips/coupler/bag for everyone to take home. If you can’t find someone to come do cake decorating, you can use ideas to decorate cupcakes- I have a sample issue from Cook’s Country magazine that had 12 ideas and a Taste of Home magazine issue with at least that many more cute ideas for decorating cupcakes. I’m sure there’s also a lot available online if you want to go that direction. 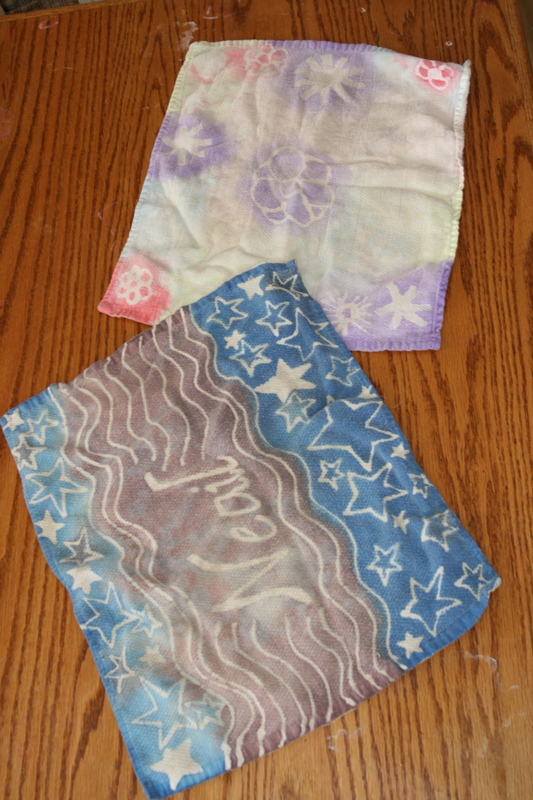 13)Batik concept from Family fun magazine- except we used a hand towel. Batik uses hot wax and dye. This version uses white glue and watered down acrylic paint. The trickiest part is finding a cotton towel with a flat side (can’t be terry-cloth on the side you glue). This project spanned 2 weeks- one week to put on the glue pattern and one week to paint. Another one some repeated at home with their kids. You use white glue to draw a design on the towel. You let it dry (overnight). Then you water down some acrylic paint, spritz the towel with plain water, and paint it. It’s SUPPOSED to bleed some as the colors go on. You let it dry. Then rinse it out with warm water and the glue comes out (as well as some excess paint) Leaving you with a white design on your towel. Color intensity depends on how much the paint is watered down. This IS machine washable. Please ignore that mine are looking a bit grungy!